LIKE TOM MURPHY, I believe everyone needs to learn how to face a camera with confidence. Unlike Tom, I don't believe Facetime will be the compelling application that makes camera-facing an essential skill of an active citizen. I think personalcasting is a story-telling skill and that's why I've integrated cameraphone moments into the creative multimedia curriculum at LIT-Clonmel's School of Media. Short Qik clips from several groups of clever students will start percolating from my Topgold channel, perhaps confusing judges at the Irish Web Awards who might be clicking through my Qik clips to see if they're worth a fluffy link. In a half-hour lecture, Tom Murphy cites several examples of citizen journalism (without calling personalcasting by that name). I think Tom's thoughts are worth reviewing by my students again, especially before the Winter 2010 exams, so I'm linking an audio file to this blog post. A MAJOR SOCIETAL SHIFT has occurred with the way we touch the internet and how we access social networks. By the time my newest students in LIT-Clonmel complete their third level degrees. 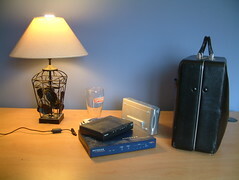 the number of mobile internet users will surpass the number of users browsing the internet via a desktop computer. That's the conclusion of Professor Manual Castells. He is a former adviser to Barack Obama's 2008 presidential campaign and member of technology panels on the United Nations. Professor Castells told a conference on web science at the Royal Society in England this week that the internet is a "key technology of freedom" for those able to access it, predicting that the planet will achieve "quasi-universal coverage of internet access as my generation fades away". In that time, he said, a "major disparity in the quality of connection around the world is a major issue of policy" for governments to tackle. Conversations I've had in Google-Ireland echo Castells conclusions. John Herlihy, head of global advertising operations at Google, has told visitors to Google-Ireland that "desktops will be irrelevant". 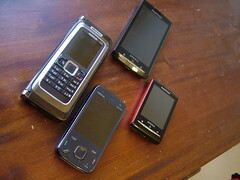 Things like the smartphones at left will replace desktops as the major access point to the internet. ALTHOUGH WE KNOW there are issues with measuring online impact through the use of a single tool, I thought it might be worthwhile to show the reach of a single lecture at LIT-Clonmel. During Tom Murphy's visit to the campus, several students tweeted his nic and several mentioned the creative multimedia lecture happening on campus. According to Tweetreach, nearly 10,000 people heard about Tom during the past week and some of those people would have read short comments from his Clonmel audience. We will analyse what these stats mean in a Web Analytics module during the spring semester. 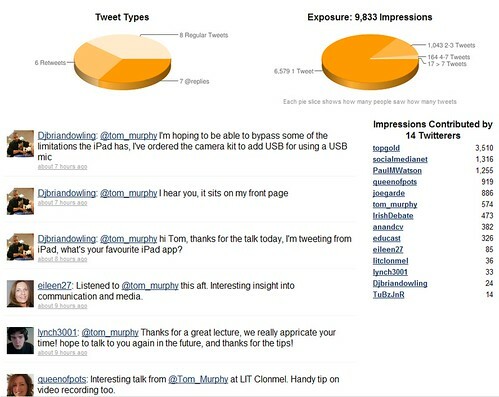 Bonus Link: Tom Murphy on analytics, 26 Sep 10. 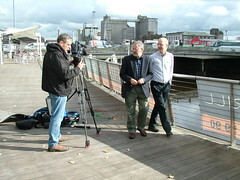 TOM MURPHY THE FREELANCE CAMERAMAN (shown on the set of Lapps Quay at right) returns to our Tipperary campus to deliver the first guest lecture of the new year. We have worked with Tom on several creative multimedia projects before, one involving a professional broadcast camera with footage that aired on PBS in the States. He will share some of his experience during a 30-minute classroom workshop and in an hour-long lecture for all creative multimedia students in LIT-Clonmel. Tom brings a passion for old world narratives, newly-emerging technology and creativity to the stage and our recording will show exactly how that comes across. He is a highly-regarded cameraman and producer who specialises in current affairs. His editing and writing of Ireland's leading social media blog deserves to be incorporated into a book. I USED TO SET ASIDE up to 20 minutes every day to clean a minimum of 300 comment spams arising from overnight visitors. That onerous task evaporated nearly two years ago with better moderation queue filters. Looking back on past write-ups I made about fighting comment spam, I remember using a manual clean-up routine along with tying in unwelcome IPs for blocking. It feels very relaxing nowadays, knowing most of the comments on this blog are actually continuations of conversation. This online medium is better for improved comment spam prevention. Four Years Ago: "Comment Spam Round 13" on September 30, 2006. LOOKING AROUND my desk (and it doesn't look as clean as the one at left) I realised that it's been six year since I last backed up onto a floppy disk. That's a little problem because now I've no easy way of resurrecting work from the world when I was a "back-up-to-floppy-person". In my hip pocket, I carry a 2GB mini USB key the size of my fingernail. It's my personal swap space. Until last semester, that amount of storage served me well. But now, I deal in HD video every week and that means I give a lot of tasks to my laptop's DVD burner. Those DVDs hold all my current courses. More significantly, easy access to dependable online strorage capacity means I can "save to net" easier than backing up to removeable media. I have 8GB of online storage for free inside Yahoo Mail and 28 GB inside Google Mail. I've got 6GB of photo storage capacity at Flickr. My bookmarks are saved in several places (Ovi, Delicious, and Furl). Twitter and Google Alerts tell me of looming events. The internet remains a blob of pulsating data for me. STEVE JOHNSON CREATED a video about how employers are increasingly using social networking sites to screen job candidates. Harris Interactive polled recruiters and many educators now think that students need to be active online, but in positive ways. It's becoming increasingly difficult to pull the eject lever and to scorch all evidence of our online personas. It's better to do it right the first time around. THE FASTER WE GET to a shematic view of group project management, the more efficient our creative multimedia project becomes. I made a five-minute Camtasia clip (see above) that points to Delicious links supporting group project management at LIT-Clonmel. Three main points arose in my lecture, related to the value of GANTT charts (and the usefulness of Gantto.com), the relationship between primary and dependent tasks and the usefulness of the Model-View-Control design pattern. AT THE START of every academic year, I ask new students to send me e-mail with a specific subject, in a specific format, to a specific address with a specific payload. If done correctly, the incoming mail weighs less than 50kb. I rarely download mail onto my mobile phone if it weighs more than 100kb. In fact, most bloated mail gets killed at my server without me knowing its fate. I set that up and it's served me well because at the moment I'm somehow exceeding two gigabytes of monthly data usage over the air with O2-Ireland. 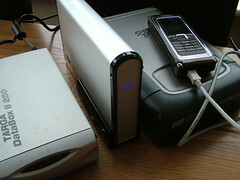 Until recently, I was synching my Exchange Mail to my Nokia N86 handset. That resulted in some memory issues on the handset because my work colleagues can't stop themselves from attaching bloated documents to their emails. They never learned to correspond differently. But one thing for sure: if you don't respond to an email with some sort of acknowledgement, people think you haven't received it. Currently, I have 55 inbound emails from new students about a C902 low-resolution video shot in Iraq and I cannot walk onto the college campus without getting stopped by the question, "Did you get my email?" I HAVE A LITTLE disagreement brewing with O2-Ireland at the moment and that means I've been cut off from most of normal network access by the operator. It's just like living outside of the range of data coverage and without even a hope of being able to text out, ring out or call my voice mail. So I'm using the time to become more acquainted with my peripherals. I have seven banker's boxes of stuff to digitise and four external hard drives that need cross-indexing. They contain 10 years of images, videos and sound clips. I have a sling sack with my Nokia N86, Sonyericsson Xperia X10 and Fujifilm S7000 on my back--all those need to be pulled into my data trove.